Chapter 6 presents us with the meatiest material in Dr. Bird's monograph. Thus, I must divide my analysis of the chapter into a couple of posts. It appears that my initial desire to go through the book in 8 weeks was a tad naive...or downright foolhardy. As I stated aeons ago in my review of chapter 1, reformed types tend to emphasize the vertical and individual aspects of justification, while New Perspectivist types tend to emphasize its horizontal and corporate dimensions. But what does St. Paul really say? And what does he really mean? Is justification God's declaration that the believing sinner has a new status in the divine lawcourt on the basis of Christ's death and resurrection? Or, is it God's declaration that Jews and Gentiles are equally members of the New Covenant community? Bird answers both questions in the affirmative, and seeks to provide a via media in this debate. His chapter is thus appropriately titled, "Justification as Forensic Status and Covenant Membership." 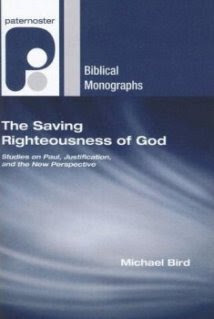 To substantiate his proposal, Bird looks at, (1) what kind of "nomism" Paul was opposing, (2) the concept of vindication in biblical theology, (3) Galatians 2-3, and (4) the link between justification and the inclusion of the Gentiles in Romans. I'll cover 2.5 of these this week, and leave 1.5 for next Monday. (1) What Paul Was Opposing? - As we saw in the last chapter, Bird thinks that Second Temple Judaism was fairly diverse soteriologically; some strands emphasized grace and covenant, other strands emphasized obedience as the basis of eschatological salvation. Bird believes Paul was opposing an "ethnocentric nomism." The Judaizers were trying to compel the Gentiles to be circumcised as the means of entering the people of God. However, these same Judaizers believed that it was the people of God who exhibited loyalty to the Jewish identity markers who would be vindicated on the last day. Thus, one cannot separate the Judaizers' emphases on boundary markers and law-keeping as the means of procuring justification. I think Bird is on the money here. Simon Gathercole has convinced me that the Jewish boast is not simply about possession of the law, but the performance of that law as the means of being vindicated before God. However, I wonder if - on occasion - Paul simply opposes nomism/legalism generally, and not "ethnocentric nomism" (e.g. in Eph 2:8-10; 2 Tim 1:9; Titus 3:4). (2) Vindication in Biblical Theology - Bird notes that the biblical theme of vindication, "includes God's action in rectifying the status of his people, executing justice for them, and publicly showing that those people are in a special relationship with him" (118). Therefore, justification isn't so much about "me and God," but God and his people. It has a corporate focus. (3) Galatians 2-3: Bird analyzes the historical background of Galatians 2-3. After an extensive discussion of Antioch, Paul's conversion/call, Jewish dietary laws and more, Bird concludes that in the Antioch incident (cf. Gal 2:11-14), the Judaizers/James' party were offended not simply because Peter was eating with Gentiles, but the implication this action carried; by eating with Gentiles without forcing them to Judaize, Peter was implying that the Gentiles were equal members with Jews in the covenant. The exegetical ramifications of this reconstruction will be explored in next week's installment. Alright Dr. Bird, here are a few thoughts I had after reading the first half of the chapter. (1) Do you think there are times when Paul argues against nomism generally (or at least speaks of nomism generally)? To me it seems there's a shift towards generalization from Galatians to Romans to Ephesians to the Pastorals. What do you think? (2) If the Christians in Antioch were celebrating the Eucharist, do you think it strengthens your proposal regarding Galatians 2:11-14? (1) I think it is possible to generalize from the particularities as to what Paul says. When Paul says that "no flesh" will be justified by works of the law, you clearly have a univeral principle embedded there. In addition, the generalizing tendency itself is already present in Eph. 2.10 which is against good works in general, though Ephesians 2-3 itself is still very much aware of the incorporation of gentiles into the commonwealth of Israel. (2) Was the meal in Antioch a eurcharistic meal? It was a shared meal of Jesus-believers and I prefer the phrase agape meal or "love feast" although eucharist is another way of talking about it. But yes, a eucharistic meal that celebrated Jesus' death and resurrection would underscore my point that Paul argued for unity over purity.